International award winning fine art photographer Leslie Alsheimer specializes in assignment editorial documentary travel photography, creating fine works of art for art buyers and private collectors worldwide. Silla de Ruedas Many disabled children in Peru will never have a wheelchair. This one was given to the Reyes Family by Living Heart Peru, an organization dedicated to supporting families in the Andean highlands. The Peruvian Andes are an area rich in history but steeped in poverty. On these rocky slopes, descendants of the Incas coax a meager living from the unforgiving soil. Their ancestors lived high for protection, but nearly all their food was grown in the river valley and carried to the cities above. Today the food grown in the fertile Urubamba valley and transported upriver from the lush jungle below is priced for the tourist markets in places like Pisac and Cusco, well above what is affordable to the native highlanders. Families such as Jose Antonio’s must live on what can grow at 11,000 feet, which consists of mainly potatoes. The lack of fruits and vegetables in their diet causes many to suffer from malnutrition. The Reyes family bears the added burden of Jose Antonio’s disability. 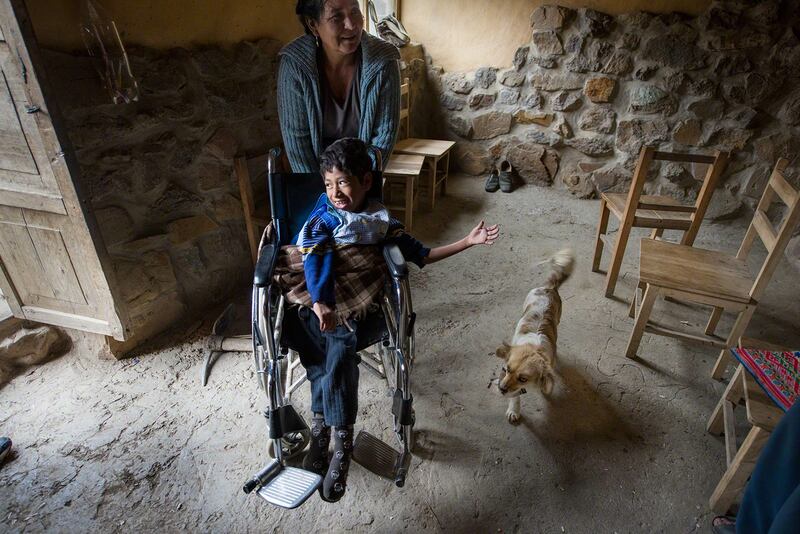 Access to healthcare in the Andean highlands is nearly non-existent, especially for those with special needs like Jose Antonio. Many disabled children born to families in these communities end up locked in darkened rooms or chained to beds by desperate parents who do not know how to care for them. The Reyes family is very fortunate to receive help from Living Heart, an organization dedicated to supporting remote, impoverished highland communities. They provide a nurse trained in physiotherapy that visits Jose Antonio twice weekly. Without this assistance the Reyes family would be unable to provide their son with the care he needs and deserves. Sadly, for every family like Jose Antonio’s there are many others in these communities that are unable to meet their nutritional and healthcare needs.